Part 2: Ep2 system ? Part 3: Performance in Berlin ? Part 4: The Score ? Piloté par / Drove by Jérôme Joy & Kaffe Matthews. Commissioned by DRK DeutscheRadio Kultur KlangKunst Berlin (G) Jan 2010. CD release EBU Acustica, Dec 2010. A network performance and radio opera for Art's Birthday 2010 in co-production with DeutschlandRadio Kultur and Ohrenstrand. SOBRALASOLAS! is a radio opera for live, streamed and recorded sounds. This project, which began in 2007, gathers a international group of sound artists who through network collaboration and performances are in the process of developing a series of acousmatic episodes. SOBRALASOLAS! does not have preestablished scenario, nor is there a story to be told. It is neither a documentary nor a radio testimony. It is a place for glossolalies and echolalias, on-the-fly recordings and ensemble audio improvisations. SOBRALASOLAS! intercuts collected and improvised sounds with the aim of recreating a new listening & soniferous environment that is both fictional and real, time-specific and site-specific. 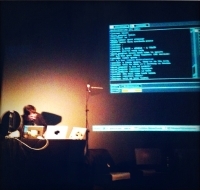 Episode 1 (2007-2009) was based on a series of remote live streamed sessions and sound file exchanges between players that were composed and released on CD (AVATAR/Ohm) in August 2009. This new episode will take the form of a live network performance. The performers, each based in different areas of the world, will improvise live, according to a loosely defined score that team have been developing. As the performance unfolds the listener discovers a multitude of possible stories and un-imaginable exchanges. Episode 2 was online and live played (at Pefferberg Haus 13) and broadcast simultaneously by DeutschlandRadio Kultur on air and EBU/ Ars Acustica for satellite broadcast on January the 17th. A 52mn-version issued from the recording of the radio network performance was produced and broadcast on DeutschlandRadio Kultur on January, 22 (Klangkunst program). Art's Birthday 2010 / Sobralasolas! Zum Art's Birthday am 17. Januar knüpft die Ars Acustica Gruppe der European Broadcasting Union wie jedes Jahr ein europaweites Klangkunstnetzwerk. Deutschlandradio Kultur schleust zum 1.000.047 Geburtstag der Kunst sechs Radioperformer an verschiedenen Orten in die Feierlichkeiten ein. Auf Initiative von Jérôme Joy vernetzt "Sobralasolas!" seit 2007 ein Kollektiv von KlangkünstlerInnen. Gemeinsam entwickeln sie eine Reihe von Episoden aus improvisierten Skripten und Partituren. Das Projekt kombiniert Netzwerke, Live-Performances, Studioarbeit und Feldaufnahmen. SOBRALASOLAS! ep2 (2010) will be produced in collaboration with Locus Sonus (locusonus.org), nujus.net and creacast.com. This radio work was commissioned by Deutschlandradio Kultur 2010. Special thanks to Marcus Gammel.